Printed using eco-friendly non-PVC inks on our 3/4 sleeve organic cotton ladies tee. Earth Creations - Organic 100% Cotton 3/4 Sleeve Tee with round neck that's "Soft on the body and our earth." MADE IN USA. 100% Organic Cotton Tee is feather soft and purely organic, and oh, so easy to wear! Featuring 3/4 sleeves. STYLES: Water Color Tree on Natural, Daisy Flowers on Raspberry & Dragonfly Diaries on Grape. Stellar quality; they keep their shape & size...Wash after wash after wash. High to Mid Hip Length. Just plain GORGEOUS! Be sure to match these with our Pants - our cotton pants are a "natural" with these Tees. 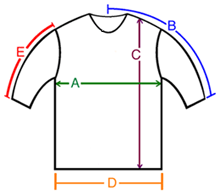 A: Chest / Bust circumference 34-35" 38-39" 24-25" 45-46"
B: Sleeve length from center of neck to end of sleeve 22-23" 23-24" 24-25" 26-27"
C: Body length from shoulder to bottom of hem 22" 23" 25" 25"
D: Hem circumference 34 40" 42" 46"
E: Sleeve length from shoulder to end of sleeve 15.5" 16" 16-17" 17-18"
I just received the size L raspberry daisy flowers top & tried it on. I was afraid the top would be too large in the bust & too small in the hip according to the garment measurements posted online. Usually I wear a size large misses 12/14, & this top fits great. The bottom hem of the garment measures 46" which is different than the stated 42" online. And I measured the bust at approx. 45" (not 48" -50"). Fit is just right & not sloppy. The raspberry color along with the various daisy design colors are super pretty! The cotton material is a medium weight & has some give to it. I rarely wear crew necks, but this purchase was an exception & the neckline is comfy. These tees are just lovely, simple designs that match my taste. I hope you get some more similar designed ones in soon!